Seal Beach Oil Field Well: A demonstration of how the oil and gas industry is co-existing within an urban environment. Here a workover rig is performing well maintenance adjacent to a community with homes worth $1.1 million – $2.5 million. 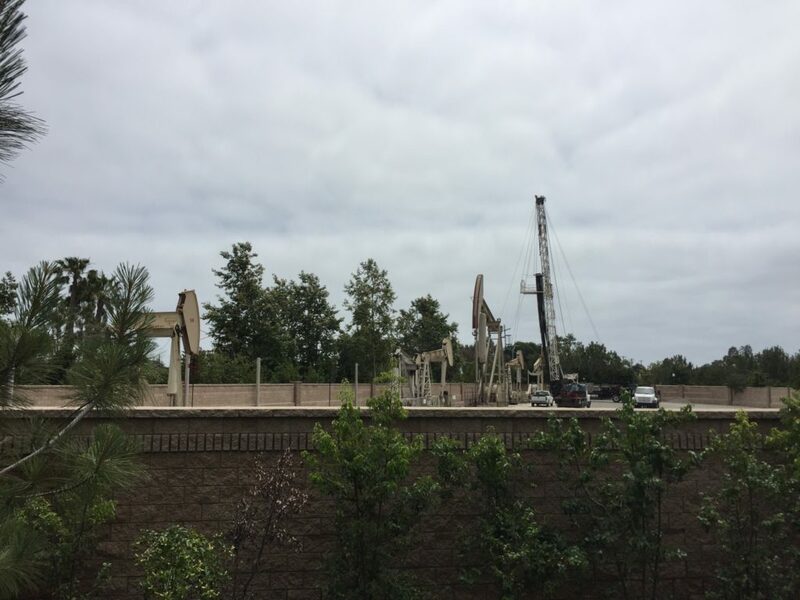 Alternate view: Seal Beach Oil Field Wells: Here is a workover rig performing well maintenance next to other wells and pump jack units. I like these photos that I took yesterday in my local community of Seal Beach, CA where I am setting up my business. It motivated me to share it with everyone as it’s a demonstration of the symbiotic relationship that the oil and gas industry in California has with the community, the environment, the city and the federal government. You see what the industry calls a “workover rig” or “completion rig” which is behind a walled/fenced in group of oil wells and pump jack units (aka “nodding donkeys” or “exercising kangaroos”). These types of rigs are an enhanced truck that’s modified with a mast and cable system capable of pulling the steel casing (mainly a steel straw) out of the wellbore to fix or improve the hydrocarbon production coming from the well. The rig and crew of two are working on an oil well that is part of the Seal Beach oil field. I won’t share the operator, the well’s name or how much oil it produces as that’s not relevant to why I am writing this article. What’s unique is that its location is at the entrance to the Heron Point Community neighborhood where the houses range from about $1.1 million – $2.5 million. Oil wells are common throughout California communities of various social-economic ranks. The famous upper-class neighborhood is probably Beverly Hills in Los Angeles. 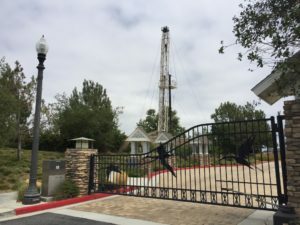 Many folks in California don’t like the wells being in their community which has led to many of the environmental groups taking action against the oil companies often using misguided information to make false claims. Santa Barbara County has taken regulating the oil industry to an entirely new level. However, I’ll save that topic for another time. Regardless, actions from environmentally strengthened groups have led to the strictest oil and gas regulatory environment in the US making it a higher challenge for local oil and gas operators to do business of providing energy for California. Seal Beach Oil Field Well: A demonstration of how the oil and gas industry is co-existing with an urban environment. 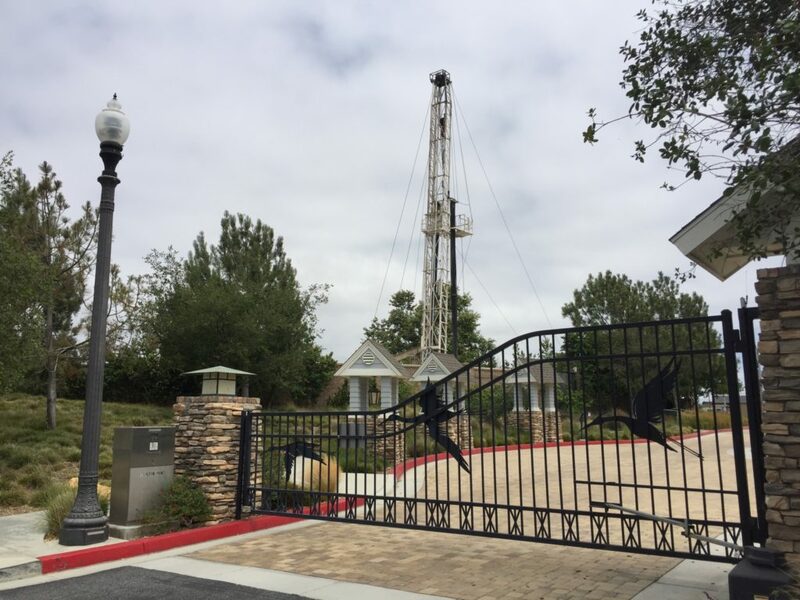 Here a workover rig is performing well maintenance adjacent to a community with homes worth $1.1 million – $2.5 million. In any event, back to the photo. You see iron silhouettes of herons that decorate the front entrance gates. Herons are part of the community as the City of Seal Beach is in Orange County and surrounded by wetlands, bays, harbors and a former NASA rocket testing center. Some of the country’s largest oil fields exist beneath the Southern California coastal environment like this one. The counties of Santa Barbara, Ventura, Los Angeles and Orange all contain oil fields along the coast as well as multiple oil platforms exist offshore California. The Seal Beach oil well being worked on is about one mile from the beach and ~200’ to the nearest house. 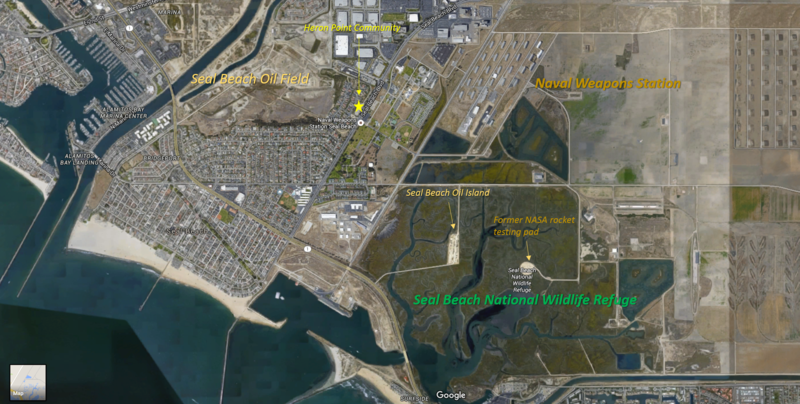 What you don’t know (and will hopefully see in the link below from the Center for Land Use Interpretation) is that across the street from this community is the Seal Beach Naval Weapons Station AND the Seal Beach National Wildlife Refuge (part of the U.S. Fish and Wildlife Service). I think that’s awesome. Some will agree with me and some won’t. Perhaps you don’t care. I think one thing that is certain is that the relationship between all these entities needs to continue in a manner where all parties benefit mutually. The oil and gas industry in California is not going away. 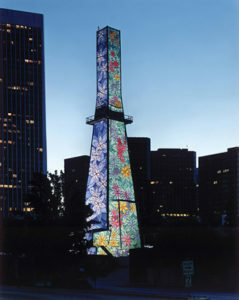 The fact that the operator of this well is spending the money to perform work on it demonstrates a balanced relationship, and that continued investment in the oil industry is happening now. It’s an excellent time to invest in oil projects like I am doing in the US. The time is NOW. The Center for Land Use Interpretation put together an online slideshow which provides more photographs that provide a larger perspective about the local area. Many thanks go to them for sharing it. See links below to the slide show and also to the organization. Please feel free to contact me at the email address below.